LP guides are almost our default choice of guidebooks whenever we initiate pre-trip research on where we were planning to go. In the case of Great Britain (note I didn’t say UK because it doesn’t include Northern Ireland), we actually consulted this guide as both a pre-trip planning resource as well as in-the-field guiding for things like places to eat as well as walking maps for both urban and naturesque excursions. In any case, the extensive coverage of a country that technically encompasses three separate kingdoms each seemingly on the verge of gaining their own independence (i.e. Scotland, Wales, and of course England) was a bonus for us. Since LP was careful in their calling this book Great Britain instead of United Kingdom, I presume that the section about Northern Ireland would be in a book devoted to the Republic of Ireland even though the UK and Ireland are technically different countries with differing currencies. As usual, we pretty much relegated LP’s pre-trip research as seeds for keyword searches for futher supplemental research since they’re very light on the photos and heavy on the descriptions, which are hard to follow on just the verbage alone. It’s only after the trip is over does the verbiage make more sense. Still, we liked their maps and how they’re keyed to the text and to other maps for context. As for in the field usage, we only consulted this guide when we found TripAdvisor wasn’t available for restaurant recommendations or we weren’t able to procure a city map and had to fall back on this hefty book. In fact, the sheer bulk of this book kind of makes it unattractive to lug around all the time even though we recognize the tradeoff between packing lots of content versus travel weight. As for pre-trip research, this book was useful in helping us recognize things we might have overlooked in our waterfalls research. If such overlook non-waterfalls attractions (or other waterfalls we missed in prior research but uncovered here) were within reach, then we’d build in flexibility in our planning to accommodate them. So that helped us keep our trip well-rounded and not too waterfall-saturated. As far as their coverage of waterfalls, they actually had quite a bit of them in this book, which I wasn’t expecting. They even noted some that eluded me in my internet research. I also appreciated their writeup on the history of the UK as well as other background information regarding the food, the culture, and the environment. The DK Guides are almost like direct competition to the LP guides. The key difference is that where LP focuses on comprehensiveness and loads of information through their dense text and maps, the DK guides focus more on the visual with photos and illustrations at the expense of depth or breadth of coverage. The text tends to leave a lot to be desired, but I figured DK held true to the phrase that a picture is worth a thousand words. We generally use DK guides as supplements or complements to the LP guides so we know what most worthwhile sights would look like whereas you might not get that in an LP guide. And both guides further serve as seeds to our keyword searches on the web to further our research on particular topics. Regarding Great Britain (not UK since Northern Ireland is not included), it was pretty much on par with the other pictorial guides from DK that we’ve used for other countries like Greece, Switzerland, Italy, and France among others. I was especially interested in places like the Cotswolds since there was a lot said of it, but not much in terms of the visuals or how best to explore it on limited time (though I think Rick Steves’ DVDs did a better job of depicting the atmosphere of the quaintness and charm of that area). I had about 3 or 4 months to prepare for the UK trip so I got pretty familiar with this book as well as the LP book. And so given all that I was able to glean from this guide, I felt it was a pretty capable resource as far as pre-trip planning was concerned. We might stomach the weight of this book for in-the-field touring some of the famous sights where they have street-by-street illustrated maps or 3-D illustrations of famous landmarks worth spending a lot of time at (e.g. the Tower of London or Edinburgh Castle or York or other famous places) since that’s what DK excels at. But as far as waterfalls are concerned, they did mention quite a few of them, but they’re more of a passing mention and thus only served to make me aware of their presence for further research (much like how LP exposed me to them). 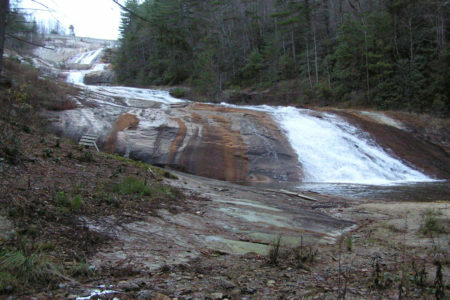 Some of their waterfall mentions (like Becky Falls) turned out to be quite dinky and expensive to boot. All in all, it was a capable resource, but nothing too special. It’s probably the same in effectiveness with LP just with different approaches. So we took the attitude of going with both just to get that second opinion. I can’t really say which ONE is better. Generally, when it comes to international research, I’m pretty happy when I can call upon a MapSource software that covers the part of the international destination that I’m headed. In this case, it was Europe, and the cool thing about this product was that it pretty much covered all of Europe. So that meant it was useful for trip planning when we drove around France, Italy, Switzerland, and now Great Britain! In addition to the functionality, I also liked the level of detail that included default waypoints for some places we were targeting (mostly accommodations but surprisingly some waterfalls as well, which was surprising considering this product was a “city navigator”). That said, there were some details that were left to be desired concerning walking paths and trails that weren’t in the map, but I guess that’s really an expected weakness considering this product was all about city navigating in Europe as opposed to navigating between natural and wild places in the continent. 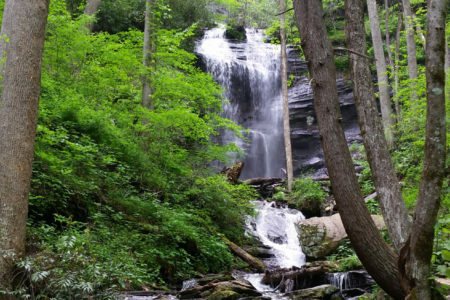 When it came to specific research concerning some hikes or waterfalls (especially the longer hikes like Falls of Glomach), it’s hard to surpass a website like this one. It’s pretty much got all the information you need to have the confidence to go out there and do a hike. For starters, it has a summary telling you the hiking distance, time commitment, ascent, and map reference. Then, it also tells you where the trailhead is as well as links to user reports on top of the original writeup by whoever is administering this site. Then, there’s even a pretty neat sound clip telling you how to pronounce the name of the hike or attraction, which I dig since I always want to know what’s the right way to say things that are Gaelic or Scottish. Now if only they have something like that for Welsh or Wales! Furthermore, they even have GPS Waypoints and tracks that are downloadable for free! 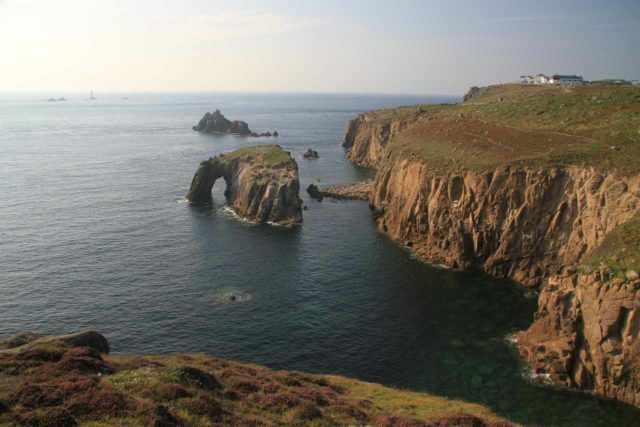 You can even download the walk to GoogleEarth as well as print the route map for portability! Bottom line is that you can’t beat this site for its generosity and wealth of information that’s just contained in the at-a-glance summary at the top of each hike writeup. Anyways, beyond the “above-the-fold” summary, then the site goes into the words-eye description of the hike accompanied with relevant photos along the way. It breaks it up into stages, which helps to further compartmentalize or break down each phase of the long walk. And at the very end of the page, there’s a picture of the route profile so you can visually get a sense of how up-and-down this particular hike is. So as far as a trip resource (let alone hiking resource) for the Highlands of Scotland, there’s simply nothing better! That said, they only focus on the longer walks and even turn shorter walks into longer ones. So that’s something to consider if you’re short on time. 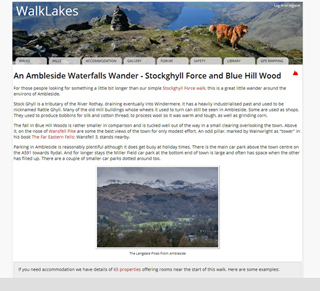 Like the Walk Highlands website, this one had similar generosity except it focused more on the walks within the picturesque Lakes District in far north England. 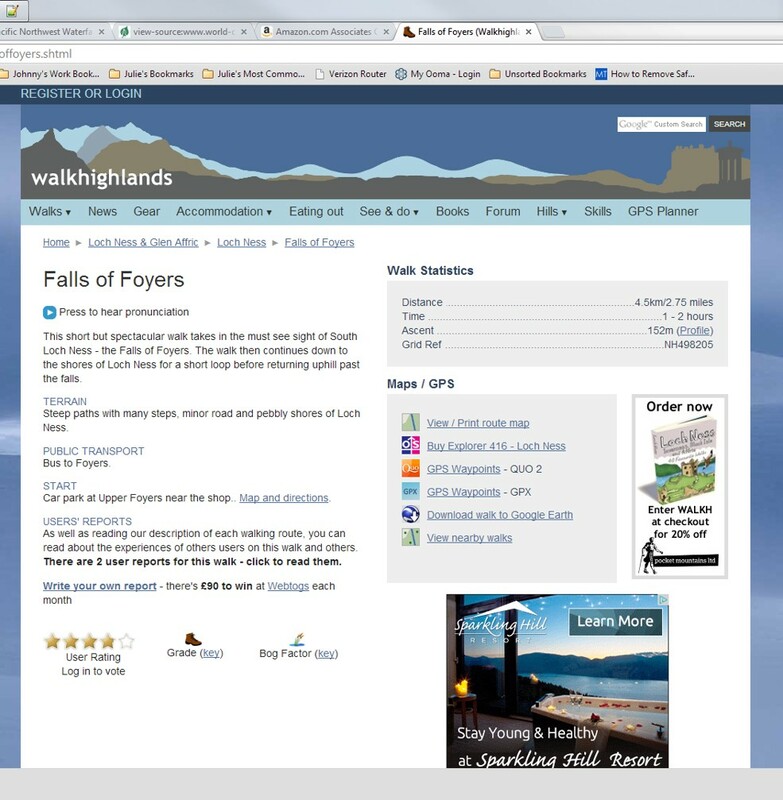 Again, I came across this site through search results for particular walks concerning waterfalls as it just kept coming up repeatedly for each long waterfall hike I was looking up for information in this region. And by generosity, I mean that it pretty much has all the information you need to have the confidence to go out there and do a hike. For starters, it has a summary telling you the hiking distance, time commitment, ascent, and map reference. Then, it also tells you the terrain and difficulty as well as dog issues for those times you want a companion on your hike. There are also map resources included an embedded one for an immediate visual of the route. There’s a link that lets the administrator email you the GPX route or else you can look at the route in GoogleEarth. And all this is followed by a Walk height profile (or route profile) so you know how up-and-down the hike is. Afterwards, the site then scrolls down into the Route Description, which has a more in depth blurb about what it’s like for each major stage of the hike. There are also accompanying photos to further give you a sense of what it’s like along the way as well as a zoom-in on a map of that section of track as well. Finally, the page concludes with nearby walks if you’re looking for other excursions nearby. So the bottom line is that this is a very useful website and quite generous for such a free resource. This was another very useful resource that I stumbled upon during my pre-trip travels. 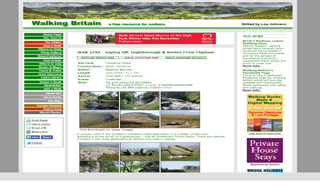 While much of Highland Scotland was pretty well covered by the WalkHighlands website, this website helped me out a lot in the more general areas concerning England and Wales. 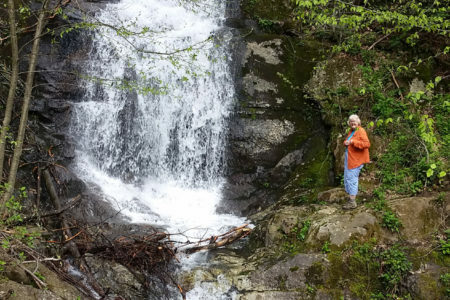 Again, I came across this site through search results for particular walks concerning waterfalls as it just kept coming up repeatedly for each moderate or long waterfall hike I was looking up for information in these regions. This was a pretty generous website as it contained downloads for Memory Map (which I no longer use) as well as GPX format, which is far more general and useful, especially for MapSource users. It also contained above-the-fold summary info and a map capture, where I quickly got a sense of where the hike is at, where to park, how long is the hike and how much time to commit, difficulty, and some basic info concerning how much climbing is involved. 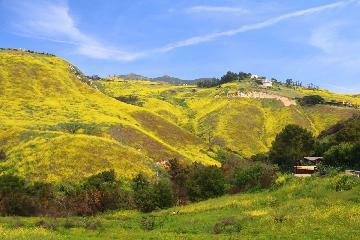 In other words, it pretty much has all the information you need to have the confidence to go out there and do a hike. Afterwards, the site then scrolls down into the Route Description, which has a more in depth blurb about what it’s like for throughout the hike. There are also accompanying photos to further give you a sense of what it’s like along the way. That’s pretty much it concerning the content, but it’s well sufficient to know before you go, and thus I found this to be a very useful (and free) resource. 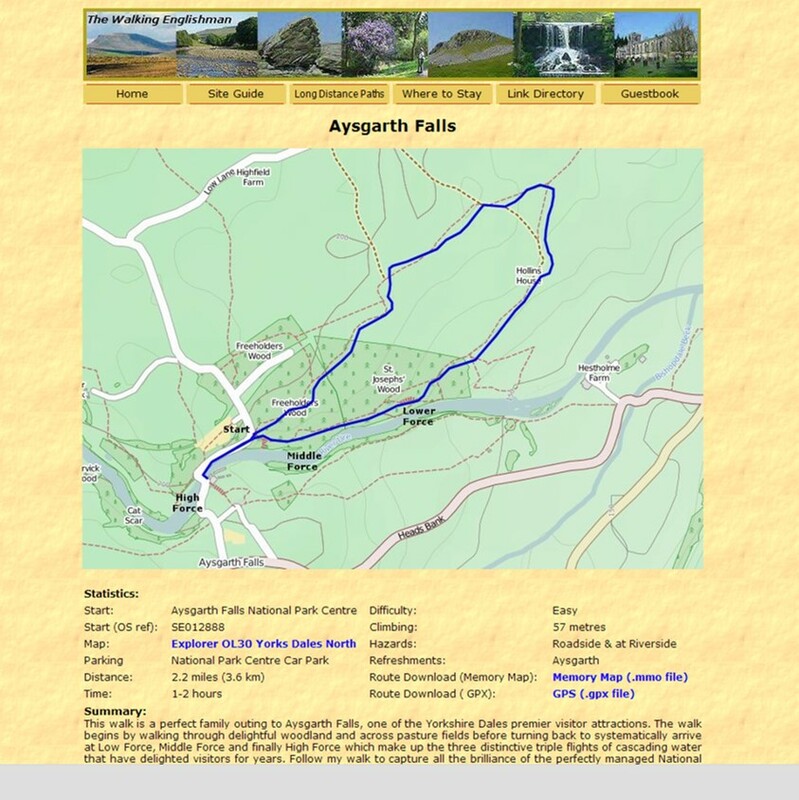 This is another free resource that I came across during my pre-trip research for waterfalls throughout Britain. This one pretty much fills in the gaps for sites throughout England that the Walk Highlands site didn’t cover (pretty much the stuff outside Scotland). Now while this site wasn’t as generous as the Walk Highlands site, it did provide pretty good information and maps concerning the specific hikes to waterfalls that I was targeting. The site also had quite a few pictures as well as GPS coordinates accompanied with boom boxes of trail length and ascent. The writeups were pretty extensive in terms of the word count, and perhaps it could have benefitted from having photos spread throughout the blurb to go a little easier on the eyes, but nonetheless, it was still a useful site, especially considering it was a free resource after all. This was yet another free resource that I frequently came across during my pre-trip research for waterfalls throughout Britain. Unlike the other online guides of Great Britain, this one took a more minimalist approach. It includes a heritage rating, then a short blurb concerning the attraction (namely the waterfall I was after), a photo, and some links to official websites and maps as well as nearby attractions. The site isn’t nearly as generous as the previously mentioned websites, but it does give me some research to follow up on further. That said, I wouldn’t put it on par with the above four websites in this review page, but for something that’s free, you can’t really complain anyways.